This shared vision led the principals to consolidate their firms. Avalon Group incorporated in the summer of 1990 and quickly developed an impressive clientele, including leaders in the medical equipment, telecommunications, and electronic access industries. 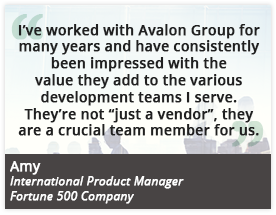 Avalon Group also chose to extend our services to design and write engineering, manufacturing, installation, and end user documentation.